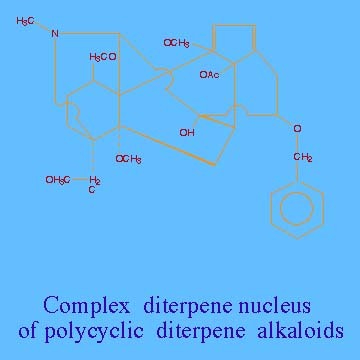 Polycyclic diterpene alkaloids have a complicated diterpene nucleus. They are found in plants in the Delphinium spp. (Larkspurs) and in the Aconitium spp. (monkshood). Larkspurs kill more cattle in the United States yearly than all other poisonous plants combined. Larkspurs are the primary source of plant poisoning of cattle on the western ranges of the United States. Larkspurs are grouped by their heigth. Low larkspurs, for example, D.andersonii and (em) D. menziesii , have a growing habit of <3 ft and are generally found at lower elevations. They are one of the first plants to emerge in the spring, even when there is still snow cover, and hence, appear inviting to cattle hungry for green vegetation. Early spring is when poisonings due to low larkspurs are most likely to occur. Tall larkspurs ((em)D. barbeyi, D. occidentale, D. glaucum, D. Trollifolium, etc.) are 3 to 6 ft tall and grow at high elevations in deep soils with plentiful moisture. They can be found in alpine meadows or under dense tree cover in aspen and pine forests and are very palatable to cattle. Calves tend to congregate under tree cover while the mature herd is out grazing. Because of their small size, calves are particularly susceptible to poisoning from the larkspur patches found in the woods. The alkaloids in Larkspurs, for example, methyllycaconitine, appear to act as powerful neuromuscular blocking agents. Symptoms of poisoning are rarely observed out on the range because animals progress to death so rapidly. The first sign of trouble may be a bloated corpse. In field trials, symptoms include restlessness, nausea, abdominal pain, muscle weakness and involuntary twitching, stiff gait, straddled stance with hind legs braced apart --> collapse --> death by respiratory paralysis. Cattle are about 4 times as susceptible to Larkspur poisoning as sheep and are killed by as little as 17g of green foliage per kg liveweight. Sheep and goats have been used to try to cut down on the larkspur population of rangelands. Sheep have not been that successful because they tend to graze larkspur later in the spring than cattle and generally do not feed on the growing points. Death due to larkspur poisoning has been reported in sheep. Goats have been used to more success. Spot spraying larkspur with herbicides and then reseeding to grasses also helps reduce larkspur populations.